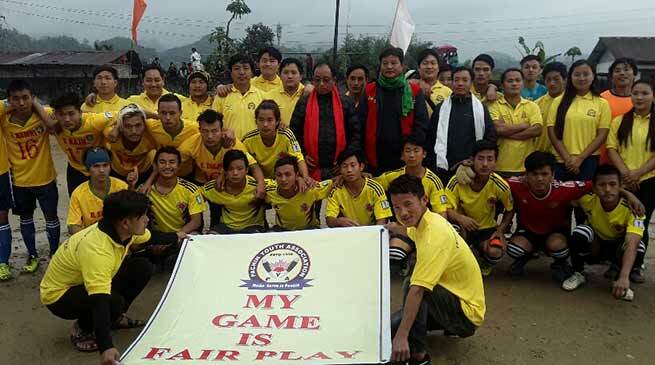 Mithun Trophy Football Tournament at Pachin, with a motto to save MITHUN, the state animal of Arunachal which is endangered. Parliamentary Secretary UD, Housing, Town Planning & Municipal Affairs of the state Techi Kaso and RWD, Sango Division Engineer Er. Tarh Tach attended the 2nd opening ceremony of Mithun Trophy Football Tournament organized by Pachin Youth Association (PYA) at Pachin Government Secondary School on Saturday. Attending the programme as chief guest Techi Kaso encouraged the teenagers participating in the football tournament and maintains the disciplined of the game. Students maintaining balance between academic and sports can make a brighter life. Kaso advised youths to stay away of toxic and negative elements to achieve positive career. He appealed the youths of the community to cheer for the players in a positive approach besides calling to create fights and negative comments during the paly. Saddened by few acts of the people residing at Pachin colony Kaso asked the youths and the people to maintain the road provided by the government. The roads are the thinner line which brings development to any area or country. The menace of drugs and other toxic substance are rising day by day in the city. People are born to live in this beautiful world but the youths are making it hell for own by addiction to various drugs. Youths have their own life but at the same time you should be concern of parents who are busy to see hope by providing the best education, Kaso added. Meanwhile he assured to work on the 2 point memorandum submitted to him by the PYA which includes construction of gallery and wall in between academic block and football ground in the ground. Er. Tarh Tach while asked the people of the colony to maintain cleanliness and hygiene around to make it people friendly. Open rearing of pigs around the colony brings unhealthy living as well as welcomes various health problems, he said. The opening match kick off by Tachi Kaso was played between Lokam brothers against Rainboyz FC where the earlier scored 3 goals defeating the later to let score just a single goal. All together there are 10 teams participating in the tournament.